Photographs are a great way to increase the positive chi in your living space and bring your environment into alignment with your true self and your goals. 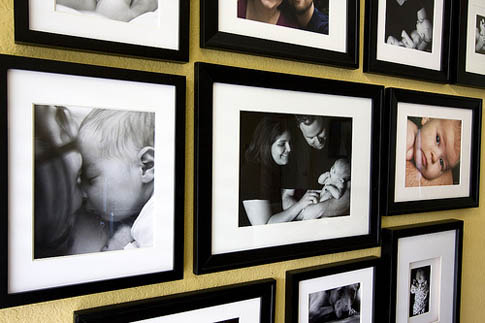 Photos can slow rushing chi down a corridor or attract positive energy to a specific space. Follow these do's and don'ts when you use photographs to Feng Shui your living space. - Make sure people in photographs are happy, smiling and inspiring. - Use the Feng Shui ba gua to your advantage by hanging photos of people you admire in the Fame and Recognition trigram, photos of kids in the Children & Creativity trigram, and pictures of you and your significant other in the Romance trigram. - Select picture frames carefully, keeping the Feng Shui elements and also the aesthetics of your home or apartment in mind. - Put photos of people in the bedroom, unless it's a picture of you and your significant other from a happy time, like a wedding picture. - Use photographs of mountains in front of the desk in your home office or a desk where your children do homework. It can lead to a sense of feeling blocked. - Hang up photos that don't represent your best self and the person you want to be today. Keeping some photos of friends from your past are fine, but don't get stuck there in your mind.